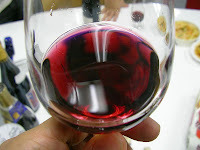 ... 2011 (today), is the 60th birthday of Beaujolais nouveau. (photo credit) The making of a vin de l'année had been an end-of-harvest tradition in the winemaking region of Beaujolais, France, but this conflicted with mid-20th century rules precluded official sales of Beaujolais until December 15 of any given year. On this day in 1951, the rules were relaxed: "the Union Interprofessionnelle des Vins du Beaujolais (UIVB) formally set the 15 November as the release date for what would henceforth be known as Beaujolais Nouveau." It is a very lightly fermented pink-purple wine that in another week will be found, thanks to much marketing by French vintners, on many an American Thanksgiving table.